Imagination is a gift, which Helen McCabe is lucky to possess. When she was a child, it was her escape from the loneliness she suffered in the real world and, later, became her path to success as an adult. She, too, has read books and written stories from when she was very small. In fact, she wrote her first long story at seven years old, sitting on a hill overlooking the country cottage where she was born. She doesn’t remember having read any science fiction at that time, but her story was about a visit to earth by aliens and was accompanied by drawings of little green men! If you like science-fiction then read her recently published short-story 1033 And All That. Her Grandfather grew up in Dunhampstead, a tiny village in the middle of England. Their pretty cottage stood by a canal and had been bought by her grandfather, who had come to work for the Galtons, an aristocratic family, who lived in a stately home two miles away. Her grandmother was a tailoress, who worked for the big house too. Her mother remembers being taken there as a child, in a carriage with two coachmen attending. Her job was to read books to the daughter of the house, Miss Emily. Her Mother worked as chief reader at a famous printing factory, and used to bring her work home with her at night to earn more money. Helen McCabe thought her mother had the best job in the world – reading all day. She didn’t understand what a hard job it was for her to look for all the mistakes and correct them. When Helen McCabe was older, she used to help her mother by reading to her out loud. Their house was full of books and Helen McCabe’s first memory is sitting in her high chair, turning over galley pages! So she was brought up with books and has always loved them. At eleven, she won a scholarship to a private school, but only made a few friends there as her upbringing was very different from the other girls, who were mostly wealthy. However, she shone academically. She loved school and hoped to take a degree but ill-health forced her to drop out. She took a job as a library assistant instead and her first writing success came at the age of 20 when she had a poem read on the BBC programme, Midland Poets. She can still remember her excitement as she read that small review in the local newspaper, praising her poem, Mists of the Morning. Marriage brought her three children, but like her mother, I had no luck with men! Realising her marriage wasn’t working, she studied privately while the children were small. Most of her academic work was done at night when the children were in bed, or in the early morning before she went to work. During that time, she worked as a secretary, a carer and a home help! Three years later, she gained an Honours Degree in English and followed it by a Master’s Degree. She remembers studying for her Master’s while she was doing the ironing with her book propped up in front of her. After that, she trained to be an English teacher, a job she loved but only managed to do for ten years, owing to health problems. And, all this time, she kept on writing, completing three novels, none of which were ever published! They are still in her files! Finally, she had to retire from teaching on ill-health grounds, but she still had the mortgage to pay, her children to support and to care for her mother, whose health was failing too! After this she realised she had to find another source of income and turned to writing romance. In 1983, she sent off a story to a national magazine and it was taken first time! This was later published in book form as Tides of Love. It was soon followed by a serial in another magazine – then another! Since then she has had many novels published and hopes to have many more! 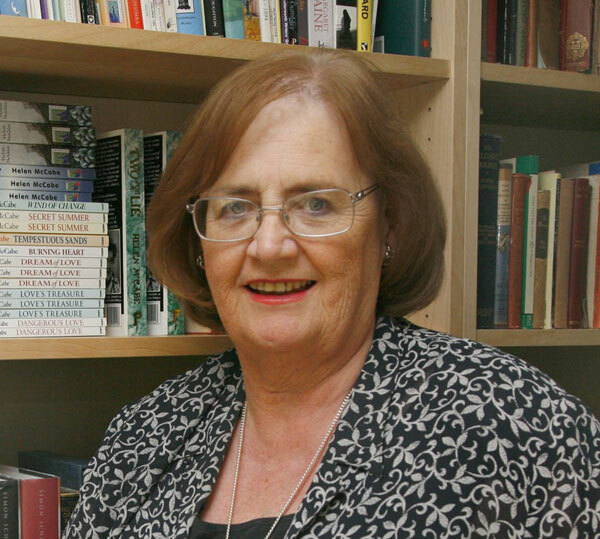 She also writes under two pen names: Aisling Byrne and Liberty Brett. Times were hard and her children were growing. But they were all clever and won scholarships. She kept on selling to the magazines but began writing long novels. She joined the Romantic Novelists Association and learned a lot more about writing, agents and publishers! She also joined Mensa, the high IQ society, where she met a TV producer, whose interest in my first ‘big’ novel, Two for a Lie, the love story of the Princess Caraboo, was to change her life. Although her particular story never made it to the small screen, the publicity surrounding the movie about the fake Princess from Devon, starring Phoebe Cates and Kevin Kline was good for her book. She still lives just outside historic Worcester. Her children are grown up and the early promise they showed has culminated in high-flying careers. Books and reading remain one of the important things in her life. She writes for several hours every day and does her own research. She may have written 20+ books, but she is still looking for the best-seller and believes every one she writes will be the one. If she does not write for two weeks, she is plagued by vivid dreams. She has also learned a lot about herself through writing and her advice to anyone who aspires to being an author, is, ‘Keep motivated in spite of the disappointments of rejection and one day your talent will be recognised.. Just keep on writing!’. You can find all Gothic.net articles and fiction relating to Helen McCabe at tag Helen McCabe.